Yes, I know it’s Wednesday. But after I threw a blogging curveball and had a guest-post-filled Monday, I want to tell you about my amazing weekend, which started last Thursday night. Earlier last week, boyfriend asked me if I would be interested in going to the Patriots game on Thursday night. Wait, the opening Pats game at Gillette, aka the start of football season? Of course I want to go. Duh. Oh, and the seats are 24 rows up from the field? Can I take my best friend too? 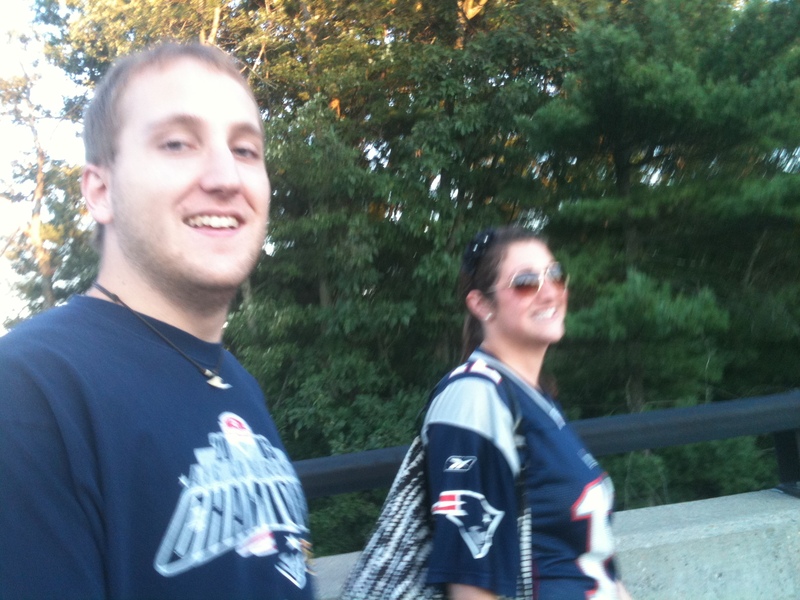 When Thursday night rolled around, three of us (myself, boyfriend and Alyse) headed to Foxboro for the game. After getting beer (our number 1 priority the second we got through security), we found out seats. Check out those Pats shirts. 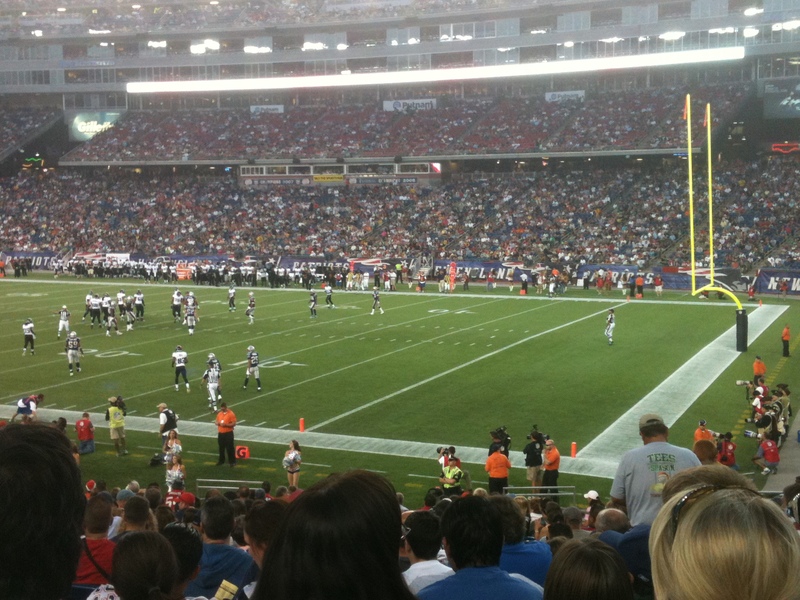 For my first ever Pats game, I would say it was wildly successful. The next night, Friday night, meant one thing: Cooking. As my good friend and fellow blogger, Megan, quotes “So you know how some people say they need retail therapy? I often need cooking therapy.” That pretty much hits the nail on the head. I knew I wanted to try a recipe I haven’t tackled yet. I also wanted something I have been craving for a while. A few months ago, I went to a restaurant in Boston called Cafeteria and ordered their veggie burger. Ever since then, I have been determined to recreate it. On Friday night, I got pretty close. Heat a skillet on the stove to medium-low. Transfer mixture to a large mixing bowl. Add the remaining can of black beans and the breadcrumbs. Season with salt and pepper and mix well until thoroughly combined. Divide into 4-6 portions, depending on how big you want your burgers to be. Place in the warmed skillet coated with a thin layer of oil and cook about 4-6 minutes per side or until heated through. Place burger on toasted hamburger half. Spread chipotle mayo (as much as you like, but be careful – there’s a definite kick to it!) on the top half and place arugula leaves on top. 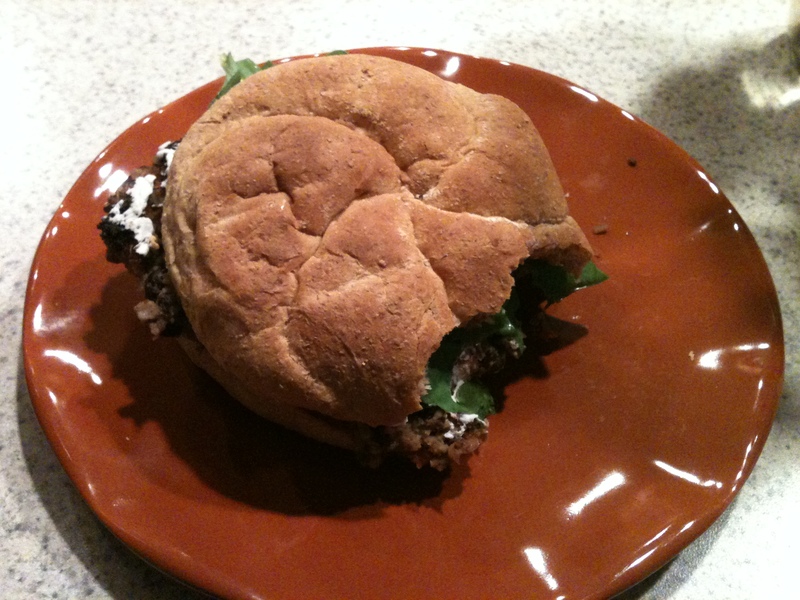 Spread about a tablespoon of goat cheese directly on the bean burger. Place mayo/arugula-ed half on cheesy burger and enjoy! The next item on the cooking agenda? Meringue cookies. Simple, melt-in-your-mouth, I could eat 50 in one sitting, meringue cookies. They took a little longer than I expected, but were delicious, airy and the perfect thing to bring to my aunt’s drinking party casual get-together later that night. Place egg whites in the bowl of an electric mixer fitted with the whisk attachment. Beat eggs on high speed until you can no longer see the bottom of the bowl, about 6 minutes or until the foam can hold soft peaks. With the speed still on high, gradually add the sugar until the egg whites hold stiff peaks. Then, beat in the vanilla extract. Transfer egg white mixture to a piping back or a plastic storage bag with the tip snipped off. Pipe swirled kisses on prepared baking sheet and place in oven. Bake for an hour and ten minutes with the oven door completely shut. Seriously, don’t open it. Not even to peek. 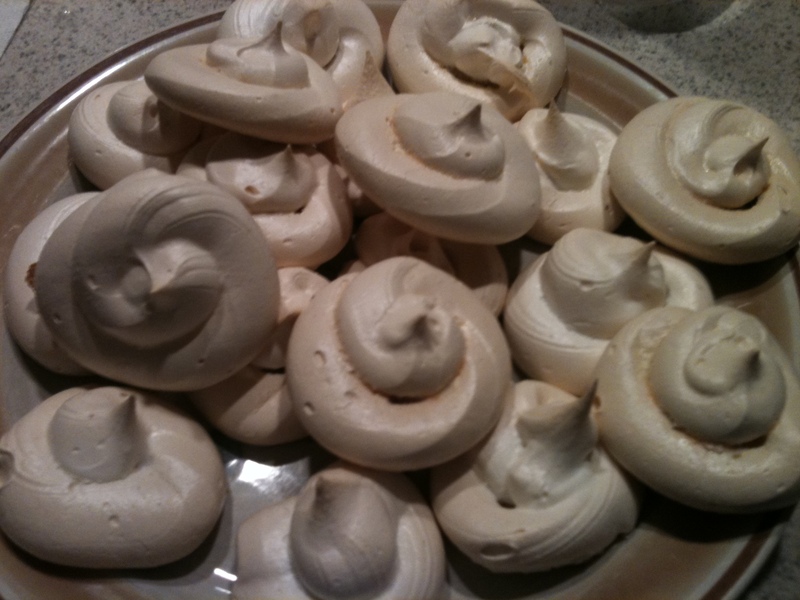 Even the slightest change in temperature while baking meringues can cause them to break. After an hour and ten minutes, the cookies should be slightly browned and dry. If you pick one up and the middle is still wet, continue to bake in 5 minute intervals until done. After my cooking and baking excursion on Friday afternoon, I rounded the night off with some quality time at my aunt’s house and drank copious amounts of red wine. Solid Friday overall. 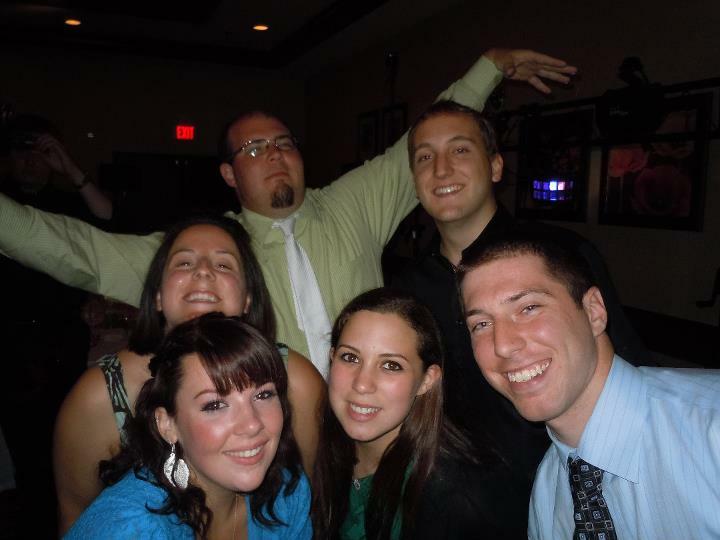 Saturday marked a very special occasion: the day the first of my best friends got married. 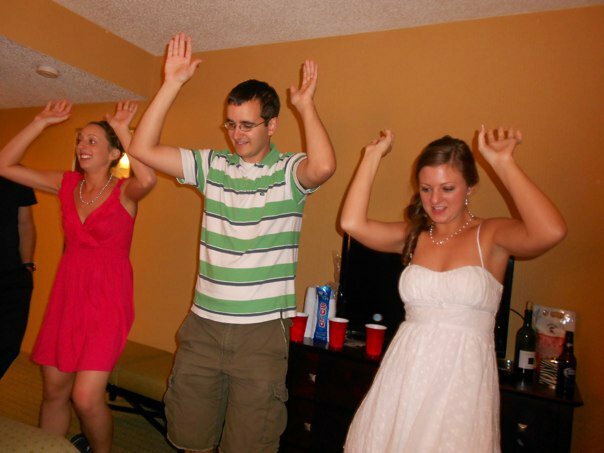 I met Amy in college and we became close friends while being involved in school musicals together. 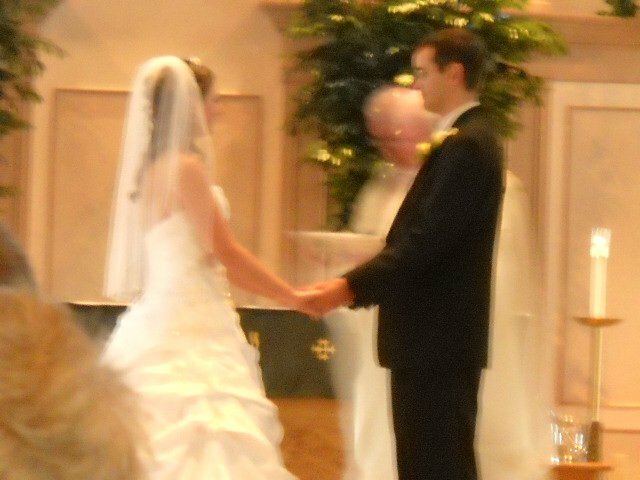 On Saturday, in a beautiful Catholic church in Nashua, NH, she said “I Do” to the love of her life in a gorgeous white dress. The second my friends and I saw her, we all started crying. It was a beautiful ceremony. She and her new husband are now honeymooning in the White Mountains and I hope they are having a fabulous time. Congrats Amy & Alex! On Sunday morning, after a late night and many glasses of wine, Stephen and I headed back to Massachusetts so he could go to work and I could go to the mall with my parents, during tax-free weekend, to buy my first Mac laptop. Even though I’m not computer savvy at all, it has rapidly become my favorite new toy. It needs a name… suggestions? Sunday night, I cooked again. I know, I was on a cooking roll this weekend. And a roll was exactly what I made. 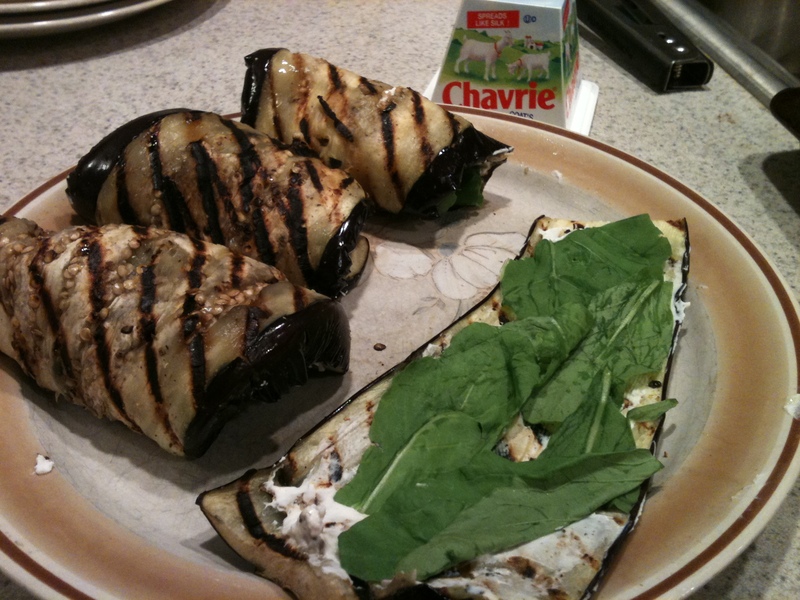 Craving more of my Friday night goat cheese and arugula combo, I sliced a large eggplant, grilled it, spread goat cheese on it, pressed on some arugula leaves, rolled them up and together, my father and I devoured each one. After a wonderful weekend, I couldn’t have asked for anything better. And then I took a kickass muscle class at the gym and the new season of DanceWorks Boston started on Monday night. How was your weekend? Are any of your best friends getting married? And what do you think of veggie burgers? Marie!!! This is Sydney from NDA…do you remember me??!! I have been reading your blog for awhile now, but haven’t commented until now…NO, it is definitely not weird to crave veggie burgers!! I do all the time!! Haha. I love them and the ones you made look so good! Well it sounds like you are doing well, have a great fall semester!! Sydney! Of course I remember you! I was so bummed when I didn’t see you this summer at Staff Meeting. A bunch of us were wondering where you were! I hope things are good with you and I’m flattered you read my blog! Good luck with school and let’s chat soon!